On our way south through Thailand, we knew we would end back up in its capital and largest city, Bangkok. You may recall that we already visited once in January, but we didn’t see all of the main sights, so we spent a few more days to discover more of what this immense metropolis has to offer. We were coming from Ayuthaya, which is pretty close to Bangkok – only about an hour or so by bus. Since we had done many long distance buses in a row, we decided to switch things up and ride the train into town. We had no idea what this entailed beyond that there were trains every hour or so. We were shocked at how low the price was: 15 baht (50 cents) per person! But this made a little more sense when we discovered that this was not a luxury train but a basic train car with open windows and old electric fans. It was pretty crowded, so at first we weren’t able to sit next to each other, but as the stops went on the crowds thinned out and we were able to be together. In the end it dragged a little bit and probably took longer than the bus would have, but it did take us into the heart of downtown and to a MRT subway station that was convenient for getting to our accommodations. If you search on the Internet for travel blogs about Bangkok, you are bound to stumble upon a good number that rave about their stay at the Lub d Hostel. We had read enough about it that we decided to see for ourselves if this slick, modern hostel was all it was cracked up to be. We booked a “railway twin” room at the Silom location. The design scheme of the entire hostel felt “industrial chic,” with plenty of metal railings and exposed ductwork. The shared bathroom was large and nice. There was a bar and common area down below. We were very excited that they had a washer AND dryer for use for a small fee. They also had a movie room – but strangely no DVDs that one could borrow, so it seemed somewhat pointless. With all these amenities and all of the rave reviews, we were expecting to love the place. But, as we have discussed before, high expectations are hard to live up to. We felt the service, especially at check-in, was a little slow and impersonal (they kept us waiting for about 10 minutes while filling out unnecessary paperwork, made us bring up the receipt on our phone even though they clearly had it on the computer, and didn’t bother to tell us to remove our bags or that our rooms weren’t ready until we had been standing there, sweat dripping, waiting to head up the stairs with our bags for over 10 min). The place was so big that we never made a connection with anyone (although I guess we could have tried to party more down at the bar…). It seemed like a lot of other travelers really had a good time though, so maybe we just discovered that the large, slick hostel is not our scene. It was also very expensive. We got a deal somehow, booking through agoda.com. But, the room that we were splurging on by paying $25/night (for almost no room, bunk beds, and shared bathroom) was apparently really worth $37/night. WAY too much. Especially since Della’s parents booked a ginormous room at a place with included breakfast, a jacuzzi, and a pool for $50/night. Lesson learned. 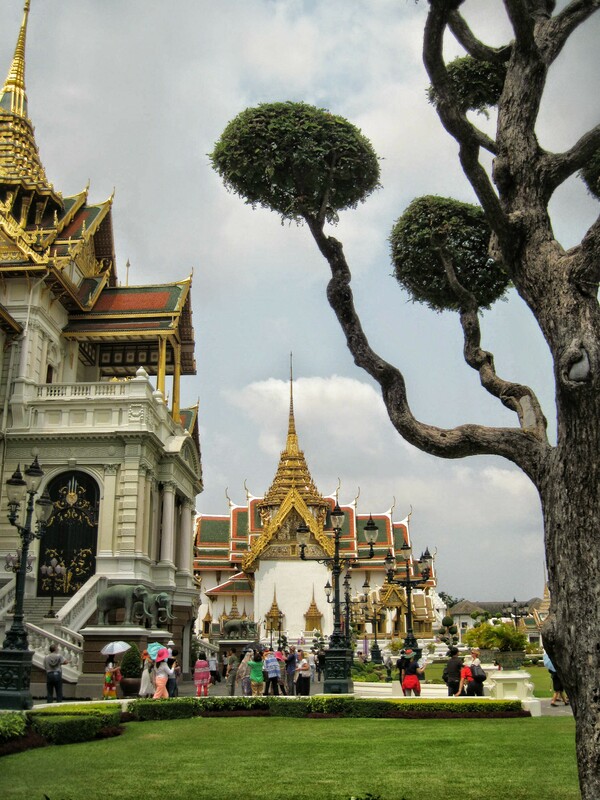 Wat Phra Kaew and the Grand Palace – We had missed the city’s main attraction on our first stop in Bangkok so we made sure to visit this time. It was a visual spectacle, but also so crowded that we aren’t sure we’d recommend going out of your way to see it! Getting there was a bit of an adventure. The grounds are located in an area that is not served by the Sky Train or metro system, so to use public transportation requires a bit more advanced planning. From the Silom district where we stayed, it seemed like one of the fastest and most interesting ways was to take the public boats that run up and down the Chao Phraya river. We lost a little bit of time by heading to a stop that is not currently operational (which begs the question of why stop 2 is still a numbered stop in the first place, but we digress). Once we got to the right stop, we got to see the intriguing loading of the boats for the first time. They try to move very quickly, so they zoom up to the docks, quickly tie a rope, and then back into place. You have to be speedy if you want to hop on or off! We got off at the Tha Chang stop and headed with the crowds to the palace entrance. We paid our steep (500 baht = $15) entrance fee and headed into the first part, Wat Phra Kaew, a.k.a.the Temple of the Emerald Buddha. We first explored the colorful chedis, then braced ourselves and dove into the big crowds squeezing in to see the Emerald Buddha itself. The statue was pretty, but far away and a little small, so we didn’t linger. We left the wat and then walked through the grounds of the palace. This was formerly the residence of the Thai royalty, and there are many fancy buildings that show a mix of Thai and Western architectural styles. Most are closed off to the public, but a few of the throne halls are open, so we wandered through them to see the splendor and take a brief respite from the heat. We followed a tip from Wayne and Peggy, who had visited the previous day (they chose to come to Bangkok while we did Ayuthaya), and finished our visit at the slightly out of the way Queen Sirikit Museum of Textiles, which allows free admission with a palace ticket. Our first intention was just to take advantage of the AC and uncrowded bathrooms, but we also checked out the exhibit on the Queen’s fashion and were fascinated. Apparently, before a world tour in the 1960, she helped revive some classic Thai styles and designed nine different outfit styles that are still used by the Thai women today. 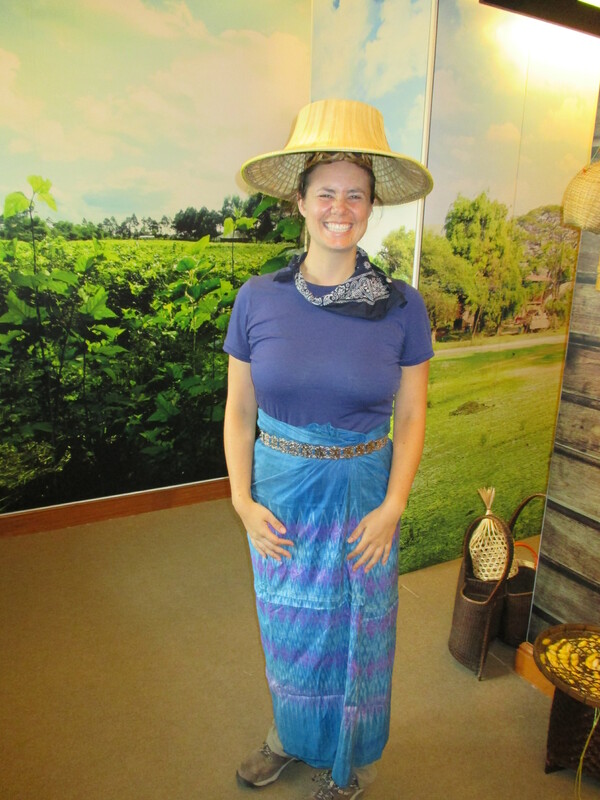 There was also an activity room that described silk fashions, and Della got a chance to try on a traditional outfit. Wat Pho – Next door to the Palace is this major attraction in town, and one that we turned out to enjoy even more than the higher billed Palace. The highlight that you encounter when you first enter is a large, reclining Buddha. We took the prescribed route around, admiring the decorations on his feet. The rest of the grounds also proved peaceful and interesting to stroll through. Highlights were colorful royal chedis, monks leading schoolchildren in classes, and old educational inscriptions that helped serve the purpose of educating the populace on a variety of topics. The visit here was much calmer (and much cheaper) than the visit to the palace, so if you only have time for one, we think we’d recommend this one! 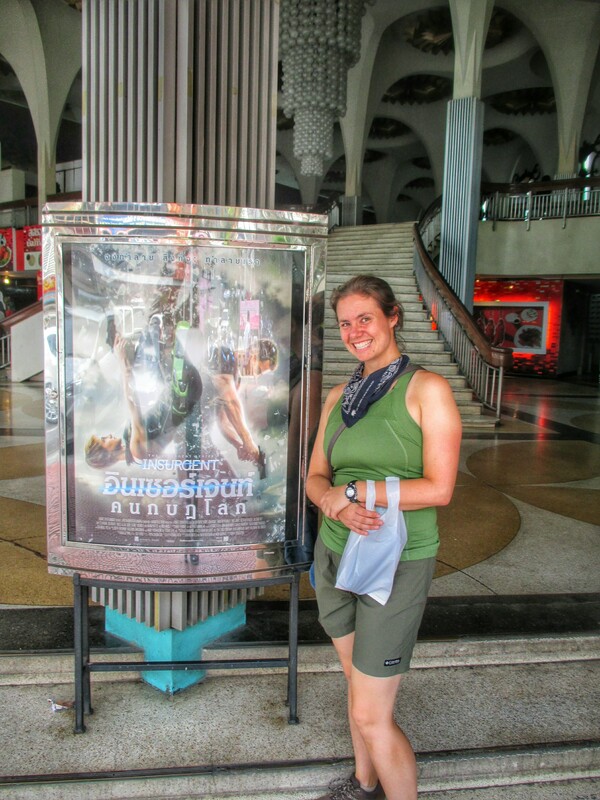 Saw a Movie – We had heard that the Thais love heading to a movie, so we thought we had to try and see a film while we were in the country. Each of the fancy malls has a nice theater, but we opted for a vintage experience and headed to the one-screen Scala theater. Luckily, it was showing a movie that we intended to see anyway: Insurgent, the second movie in the Divergent series. (Funny that both movies we have seen on the road are sequels in YA dystopian series). The inside of the theater felt old-school, with red velvet seats and ushers in yellow suits escorting us by flashlight to our assigned places. The screen and sound system were nice and modern however. One interesting experience unique to Thailand was that after the previews, they played the national anthem while showing a montage of clips of the king, throughout which the entire audience stood out of respect. The movie itself was good. It diverged (get it?) quite a bit from the novel, but in a way that made it have more action so it was pretty exciting. 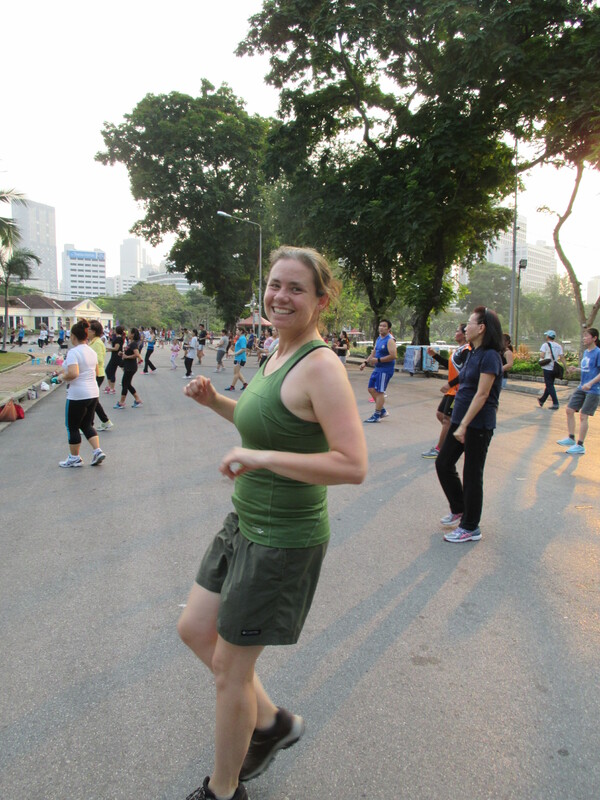 Danced in Lumphini Park – We joined Bangkok residents in their nightly workout routine! The Silom neighborhood where we stayed is more of a business district than a tourist district, so our cheap restaurant and street food options were a little limited. The Lub d staff did point us to one alley, Silom Soi 20, where there were some stalls and a few restaurants set up. We ate here twice, both times choosing restaurants with indoor seating to get out of the heat. After visiting the Palace and Wat Pho, we decided to check out the Khao San backpacker area in the Banglamphu area to see what we were missing out on. We hoped to be able to find a lot of cheap street food, but we were looking in the middle of the afternoon and didn’t see nearly the variety that we had hoped for. We ended up choosing a small sit-down restaurant that was open and had Della’s preferred dish, pad see ewe. Before we saw the movie, we decided to visit a mall food court for lunch. We decided to branch out (the last time we had visited MBK’s two courts), so this time we went to “Food Republic,” the food court on the upper level of the Siam Central. It felt a little fancier than the cheaper court in MBK, but the prices were reasonable and the selection was pretty good. 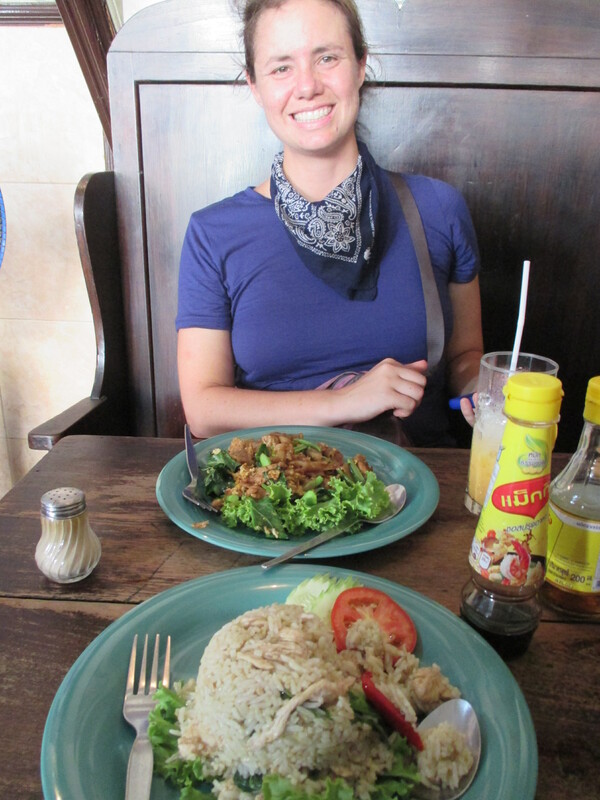 Della was able to get a pad thai and Eric had green curry with roti (Indian fried bread) instead of the standard rice. We’re glad we had a few more days to see more of the sights in Bangkok. It’s a big city, so we still didn’t even see everything on our list! The heat and humidity made it hard to want to push to see lots of things, so we’d like to come back when it’s a little cooler. It was nice to be back in a big city and have easy use of public transportation as well. 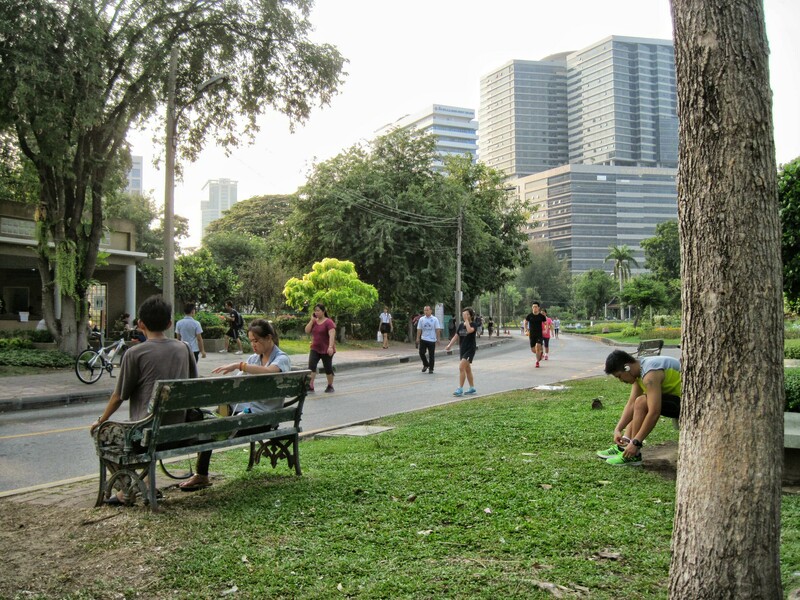 Bangkok’s a little frenzied and the climate isn’t the best, but we think we like it! In between Chiang Mai and Bangkok are two sites of special historic significance in Thai history: Sukhothai and Ayuthaya. Both were the seat of ancient kingdoms that are seen as predecessors to the modern government of Thailand, and now both are UNESCO World Heritage listed sites. We debated only visiting one, but ultimately decided that we needed to see both to better understand Thai history. The Sukhothai kingdom came into prominence in the mid-13th century AD after the Khmer empire (the one that was based in Angkor) began to decline. It grew into a strong regional power and is known today for the unique artistic style that can be seen in the remaining temples. There are a large number of ruins to be seen which are spread out over a moderately-sized range. We rented bicycles by the entrance booth to make sure that we could reach the further-out sites. We also rented audio guides, which proved to be quite helpful both for understanding what we were seeing and helping us choose which of the sites to focus on. (One tip for future visiting couples – each guide player has two headphone jacks, so if you bring an extra pair of headphones you can share a player). The park is split into a few different zones that each require their own ticket. We focused our visit on the Central Zone and the Northern Zone. The Central Zone contains the majority of the interesting sites worth visiting. One of the most impressive is also the biggest: Wat Mahathat. There are many ruined columns of old gathering places, and Buddha statues and chedis (a.k.a. stupas, cone-shaped structures that hold a relic). The biggest attraction of the Northern Zone is Wat Si Chum, which contains an impressive large Buddha that is a great example of the Sukhothai style of art. The location of this image helps amplify its impact: at first you can only see the face, until you slip through a narrow passage and find yourself at the base of the immense seated figure. Buddha’s tapered fingers are now golden after having gold leaf applied to them. There are many other temples worth seeing in the two zones as well. We visited the different sites listed as stops on our audio guide. One interesting feature we noted was the influence of the Khmer empire was still felt: many of the temples had towers that would have looked at home in Angkor Wat. There is also a National Museum on the grounds that we visited mostly to try to understand more about what we had seen but also to escape the oppressive sun and heat outside! The air-conditioned space had a decent presentation of artifacts from the various periods of Sukhothai history. The kingdom of Ayuthaya, located on an island in the middle of a river about 50 miles north of present-day Bangkok, came into prominence a couple of centuries later than Sukhothai. It was the capital of the kingdom of Siam and the major trading port with the outside world. An invading Burmese army destroyed most of the city in 1767, but some restoration has been done. The sites in Ayuthaya can be divided into two areas: on the island and off the island. We rented bicycles to visit the sites on the island, and took a boat cruise to see those off the island. The largest and most important site on the island is Wat Phra Si Sanphet. It is just south of the what’s left of the palace, and its convenient location made it a popular temple for the kings to visit. Today the most important pieces remaining are three large chedis that house the remains of former Ayuthaya rulers. The other big temple to visit on the island is Wat Phra Mahathat. It was also an important temple during its heyday, but now is a big tourist draw because of a unique and curious sight: the head of a Buddha image wrapped up in the roots of a tree. No one is sure how this got here. At both of these two large sites we rented an audio guide. Whereas in Sukhothai the guide covered multiple sites, in Ayuthaya they had detailed guides only for the two big sites. We also took short visits to the modern Wihan Phra Mongkhon Bophit, which houses a large bronze Buddha statue, and Wat Thammikarat, which has a chedi with lion statues at the base. Unlike Sukhothai, which sold a pass for each zone, Ayuthaya charges a fee at each site, so there were a few larger temples we just admired from a distance. There is a national museum on the island, but instead of paying money to visit it we decided to follow the Lonely Planet recommendation and visited the Ayuthaya Tourist Center, where we got more information about what to see (they are really good about giving maps in Ayuthaya) and also enjoyed visiting a free exhibit about the history and culture of the site. Our accommodations in Ayuthaya offered a boat cruise to see a few of the different sites off the island and just off the river. Our small boat took us and a few other people on a big loop around the island, stopping at three different places. Wat Phanan Choeng had a large Buddha image and a platform out on the river where one could earn merit by feeding the fish below (and the fish certainly knew this). Wat Phuttai Sawan had some ancient ruins, a reclining Buddha, and a large Khmer-style prang. The highlight of the boat trip was definitely the last stop at Wat Chai Wattanaram. It also felt very much like something that could have been plopped down in Angkor. The setting sun made for some nice light against its different Khmer-style prangs. In Sukhothai, we stayed in the town of New Sukhothai, which is about 10 km away from the historic center but has the majority of the accommodation options. To get to and from the historic park, we took the local “bus” which was basically a large pickup. We stayed at a slightly fancier place, Pai Resort, than we would normally because it had a pool. We took advantage of this in the heat of the afternoon each day and it was quite appreciated. Our dining options in Sukhothai turned out to be a bit frustrating. We were staying near a few different restaurants that were in the guidebooks, but they were all closed on both days we were there! It seemed like the town was already shutting down for the low season. 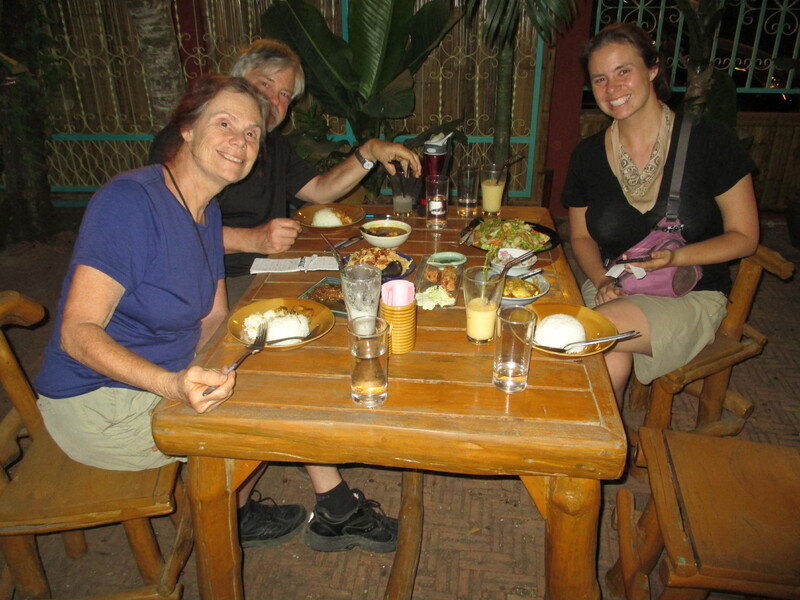 We ended up eating at a neighboring guesthouse twice because they were the only ones open. We did enjoy one nice meal at the night market, where we had a variety of street food. The most fun part of the market was when Della got to dance… (more on this later). In Ayuthaya, there were plenty of accommodation options on the island that the historic park is on. We chose to stay at the December House, a small guesthouse that is a bit far from the park but is very near the ferry that will get you to the train station. They also rent bikes which allowed for a quick ride into town. We ate dinner in Ayuthaya at two different night markets. These were a little smaller than other markets, but had a decent variety of food. We ate lunch during our day of temple exploring at a local noodle shop where we were able to get a basic noodle soup for very cheap. On one hand, we are glad that we visited both sites to be able to understand more about the Thai history and to see the evolving styles of art and architecture. On the other hand, by the end of our time looking at temples we were starting to get a little burned out, and the sites weren’t that different from each other. It’s hard to say which is “better”: the tourist infrastructure and town of Ayuthaya seems to be set up better, but the ruins in Sukhothai seem to be in better shape. So we can’t give a simple recommendation, but can assure you that whatever you chose, you won’t be disappointed! Ayuthaya had cute tuk tuks – a whole new style! We had high expectations for our visit to Chiang Mai, the biggest city in the northern part of Thailand. We have read about many people that have fallen in love with the city and chosen to move there, so we anticipated that we would have the same feelings during our five-day visit along with Della’s parents. But did we?? Choosing a place to stay in town proved to be tough, not because there weren’t enough choices but rather because there were too many. There were quite a few fairly highly rated places in town, with none standing out above the rest. 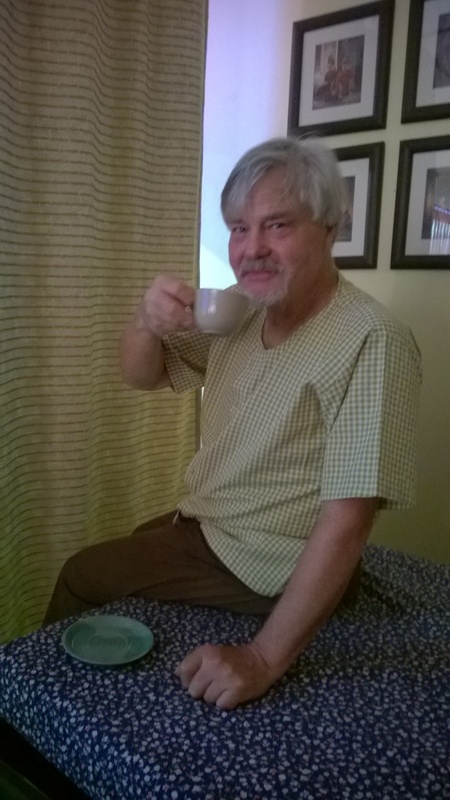 So we shifted our strategy and only pre-booked two nights at Nonni Guesthouse. This turned out to be a nice and friendly place, although it was on a fairly busy and noisy street and our room was tiny (and had a shared bathroom). So, on our first evening in town we scouted out other locations in the old city area and found the Anoma BB 2 on a quiet side street. It was only a few dollars more and had a private bathroom and included breakfast, so we spent the last three nights there. Chaing Mai’s importance stems from its history. It was founded in the 13th century AD as a new capital for the Lanna kingdom which covered what is now northern Thailand. Chiang Mai had its own independent monarchy up until merging with what is now Thailand in the early 20th century. Many of the sights around town date from the era when it was the capital of the flourishing kingdom. The “old city” in town was originally the center of the Lanna government. Today it is still surrounded by a moat and a few crumbling walls and gates. 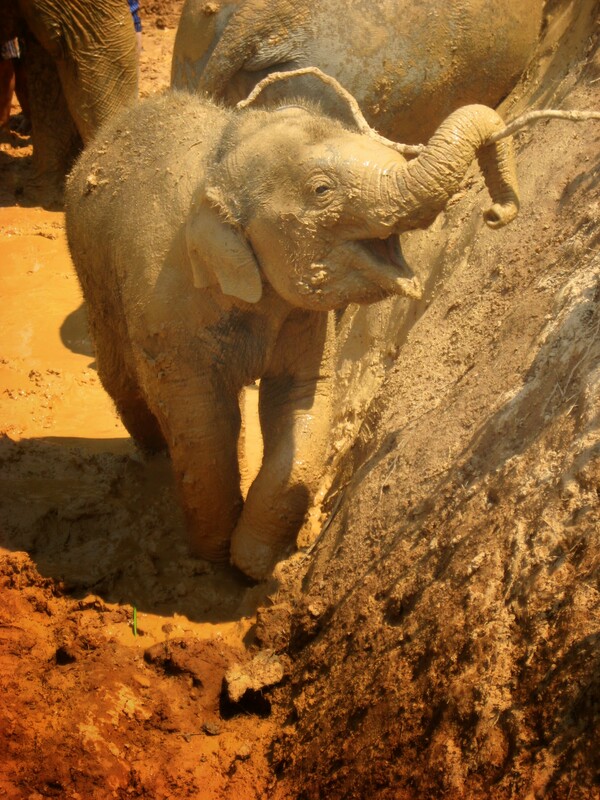 Elephant Experience – There are a plethora of opportunities to play with elephants around Chiang Mai. We were pretty happy with our choice! Check the above link for more! 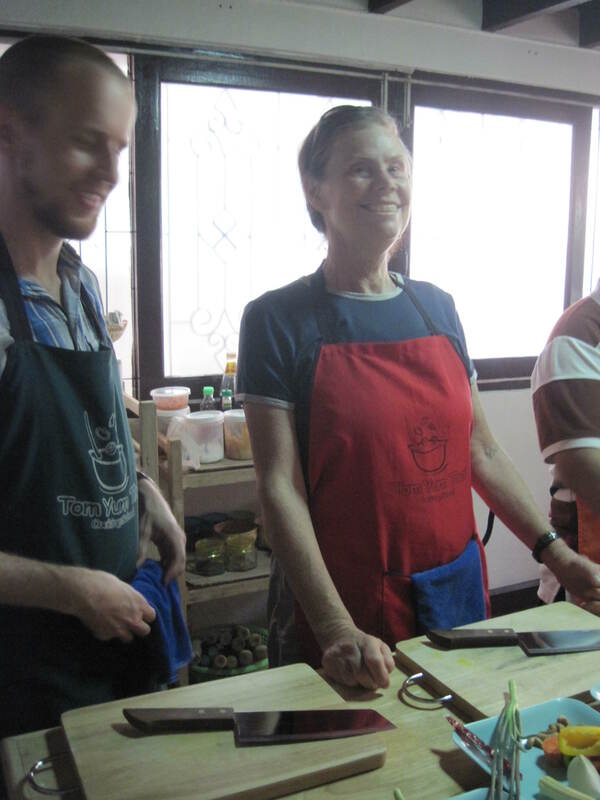 Cooking Class – We also took advantage of a fun cooking class in town! Wats in the Old City –Within the walls are a large number of wats (Buddhist temples), since the Lanna kingdom was Buddhist. We visited the two biggest wats: Wat Phra Singh and Wat Chedi Luang. Wat Phra Singh is the home of the Phra Singh Buddha image, although we got a little confused because we expected the image to actually be a lion (Phra Singh means Lion Buddha), but instead it was just a Lanna-style Buddha. These are not real people. They are statues. This was kind of creepy. The main attraction of Wat Chedi Luang is the remains of a large chedi (the same thing as a stupa, a large conical structure that holds relics). We also found the wihan (the main hall) to be pleasing. Over the course of our wandering we also found a temple made of teak (Wat Phan Tao), a temple made of silver (Wat Sisuphan) and a few other scenic ones scattered about. 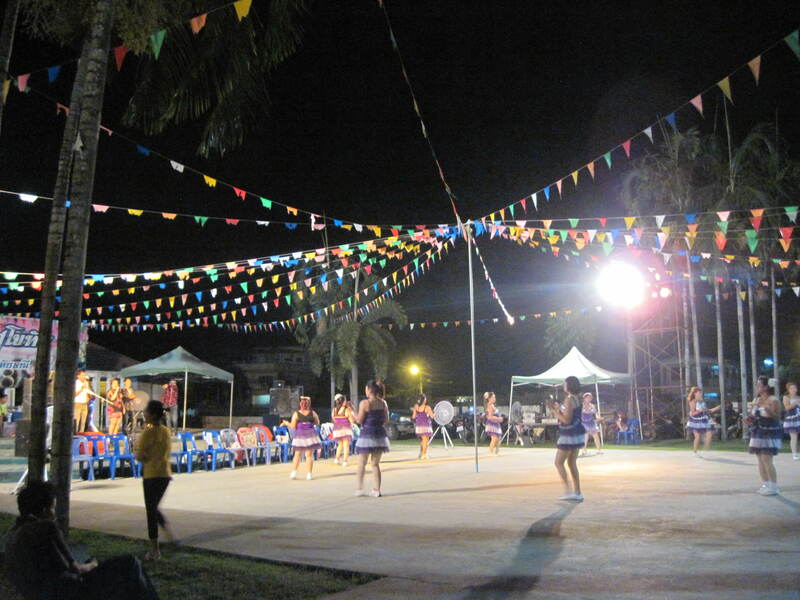 We also got to observe some fun events surrounding a celebration at the wat near the Nonni Guesthouse. 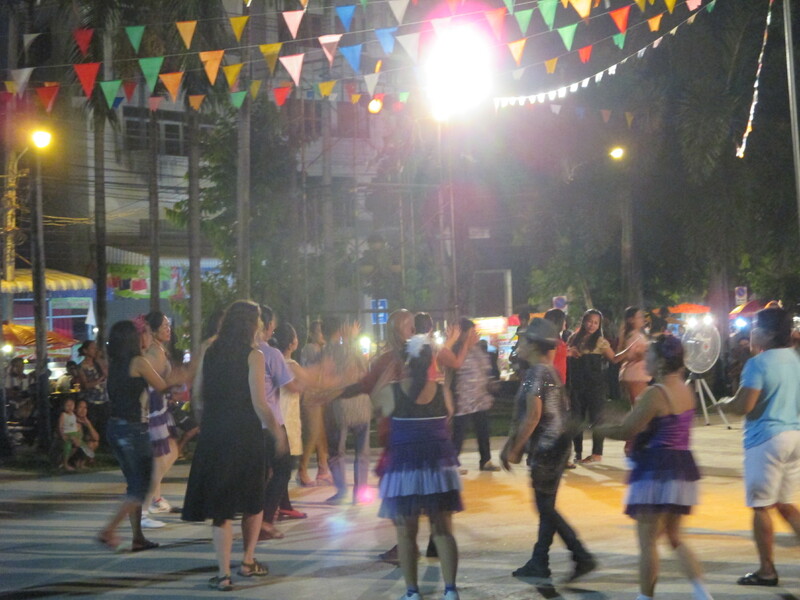 In honor of its anniversary, there were many events, including one evening where there were multiple processions with dancing, music and monks. The dancing was pretty interesting to watch: there were some groups dancing a traditional Lanna dance with long metal nails on their fingers and then one small group of Hmong women doing their own style at the same time. Wat Phra That Doi Suthep – One of the most famous wats in Chiang Mai is not in the city itself but rather in the hills to the west overlooking the city. One evening we shared a taxi with some travel friends from the slow boat and headed up the curving road to the base of the wat. From the parking lot, we took the 300 steps straight up the hill to the site of the impressive wat. The main attraction is a large gold chedi which looked especially splendid as the sun began to set. There was also a nice viewing platform overlooking the city, but the air was so hazy from the farmers burning their fields that we could hardly see anything. History and Culture Museums – Chiang Mai has three museums in the center of the city that one can visit using a combination ticket. We ended up visiting all three. The Chiang Mai Historical Centre told the story of the city from its founding to modern times with some nice modern displays, although it was a little hard to follow some of the translations. The Lanna Folklife Museum had various informative displays on the customs and artwork of the Lanna people. The Chiang Mai City Arts & Cultural Centre was a bit of a combination of the previous two, with some history and some cultural information, although it felt a bit more dated than either of them. Museum of World Insects & Natural Wonders – A friend back home recommended that we visit this quirky museum set up by a husband and wife team that have dedicated their lives to the study of mosquitoes and malaria. It’s kind of hard to describe what we found here as a museum; it is more like the personal collection of the couple of any natural object they found interesting, including rocks and many different types of beetles. Also scattered through the displays were some of their paintings and some information about mosquitoes, their history and advice on life. Who knew there with this many types of mosquitos? Thai Massage – After a successful first massage for Eric in Bali, we decided we had to check out the Thai massage to compare. After a little bit of research, we discovered that some of the most popular and cheapest places to get massages in Chiang Mai share one thing in common: they are staffed by female convicts or ex-convicts who have gotten trained as part of a rehabilitation program (seems like it might even incentivize someone to go to jail so they could get a job!). We went with the company staffed by ex-convicts. Beyond the interesting story about the personnel, we did notice quite a bit of difference between the Thai and the Balinese massage. This time we were wearing a provided outfit, no oil was used, and the massage felt like much more of a workout than the relaxing Balinese one. They bent us into a few shapes that were pretty extreme! We continued to enjoy the relative cheapness and good variety of Thai food to be found on the street and in small restaurants. For the most part, we ate at small restaurants because it was pretty hot and humid outside, and a little relief with shade and fans was appreciated. One notable exception was a meal of street food we picked up at the Saturday Walking Street, a large night market on Saturdays that was just around the corner from the Nonni Guesthouse (a little too crowded for our taste though). None of the restaurants stood out over the others: all had a good selection of fried noodles and curries. We did have an annoying trend for a few days where one person’s dish would take way longer to arrive than anyone else’s. We obviously found a lot of fun things to do in the city – we spent five nights and didn’t have much downtime. The people were friendly and the food was affordable. Nevertheless, we’re a little sorry to say that we only just liked Chiang Mai, not loved it. The heat and the haze from the fires outside the city were pretty oppressive, the narrow streets made the pace a little hectic at times, and it was a little hard to get around without having to call a cab. Maybe it is an issue of expectations: if we had come in not expecting to love it, we may have decided that it was a fun place to visit with an interesting history. Or, maybe it was an issue of timing; if we had come at a time when it wasn’t as hot and hazy, we might have enjoyed exploring more of the city. But since we had heard such great things, we instead just had to say it didn’t quite live up to it. Food in Thailand – yum! This has been one of our absolute favorite places in the world when it comes to eating. Della is in heaven eating her fried noodles – whether it be pad thai or pad see ewe – every day! Eric has loved all the different kinds of curries! Everything is delicious and we could probably eat here forever. For that reason, we were super excited to do a cooking class. 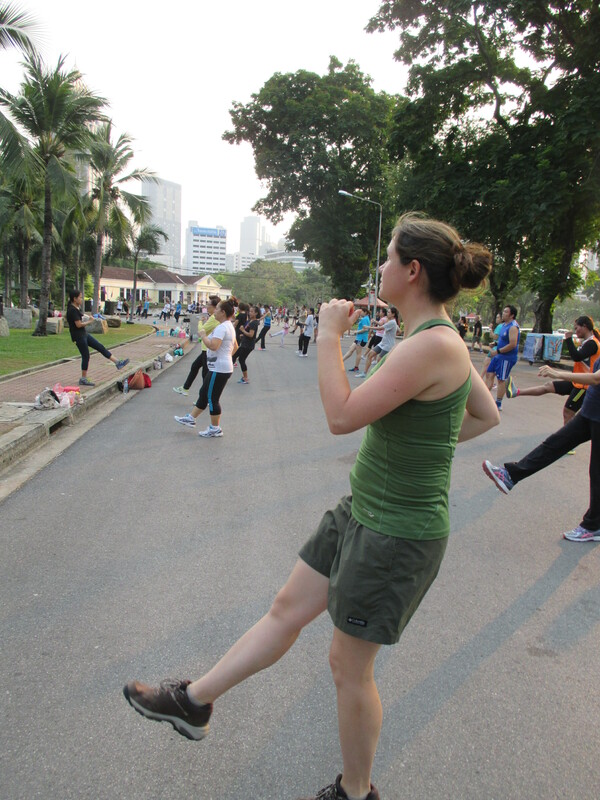 We had some time in Chiang Mai and we knew that there were several classes offered. Della picked one where one of the main offerings was Pad See Ewe. The one we chose was called Tom Yum Thai Cooking School and we loved it. 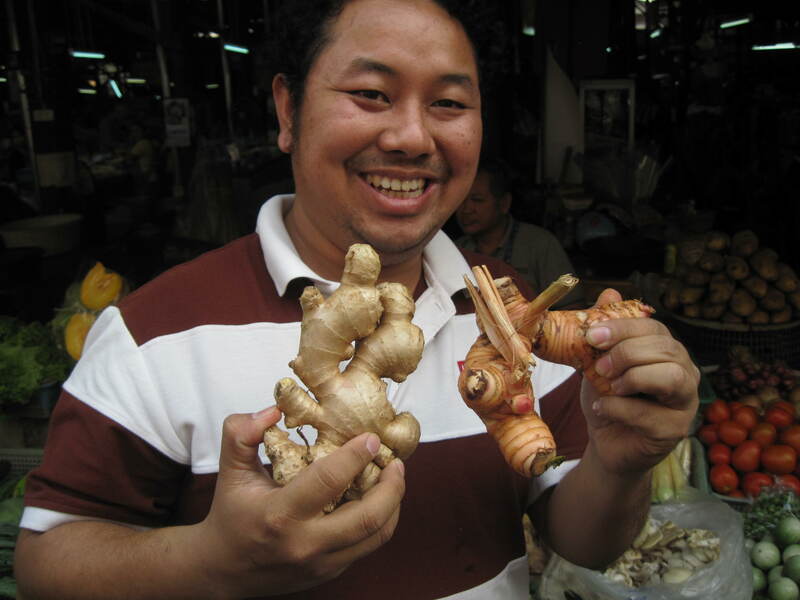 Ginger and Galangal are almost the same, but different. Raw turmeric looks a lot like ginger. 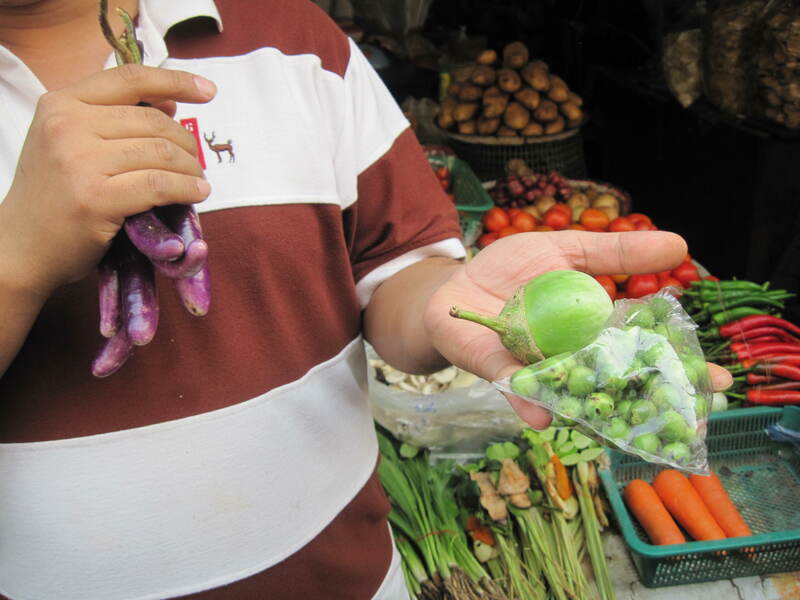 There are a ton of different kinds of eggplants – the Thai ones we used were tiny. 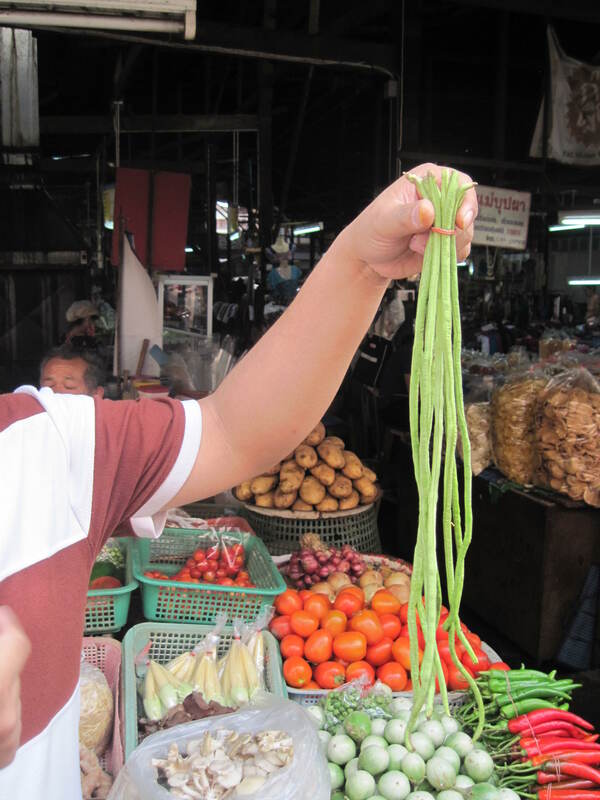 Long beans in Thailand are truly long! 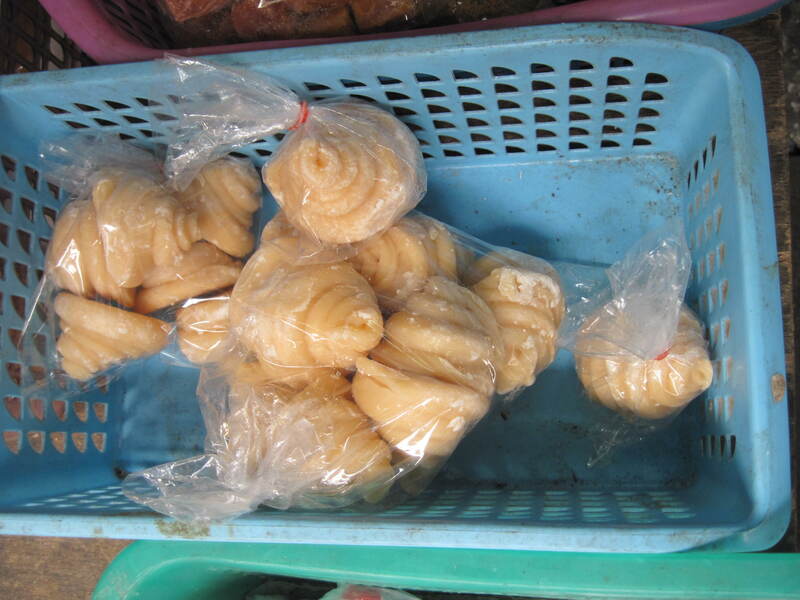 Palm sugar is a thing and can be sold in different ways. We also just enjoyed wandering the market with someone who knew what everything was. After shopping for our food, we hopped back in the van and headed to Oun’s house. Here we quickly got dressed up in our aprons, ate a quick snack of prawn crackers, and then began to cook. Eric and Peggy getting ready to cook! Throughout the cooking class, we had the chance to cook and eat 5 different courses. For each course, we had a choice of three different things to learn to make. For the most part, because it was Eric, Della, and Peggy taking part, we each did something different. Della learned Pad See Ewe, but both Eric and Peggy learned Pad Thai. For each course, we learned our ingredients, the best way to prepare them (chopping, smashing, etc), and then the order in which to cook. We won’t tell you too much more: you’ll have to go take the class yourself! Cooking these dishes did make us want to buy a fancy wok when we get home. Della learned Tom Kha (chicken in coconut milk soup), Eric learned Hot and Spicy Pork Soup, and Peggy learned Hot and Sour Prawn Soup. The base of the different soups was actually quite similar, and there were only a few ingredients that distinguished them. For example, Eric’s soup did not use coconut milk but the others did. 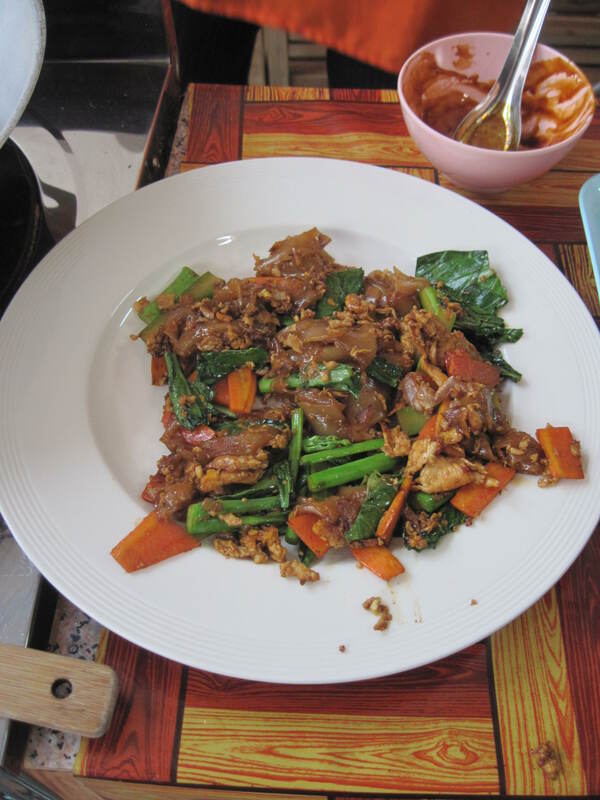 One year ago this month, we were creating tasty Thai dishes in Chiang Mai. Della learned Cucumber Salad, Eric learned Mixed Fruit Salad, and Peggy learned Papaya Salad. All of the salads used the same homemade dressing, which was a flavorful mix of sweet, sour, salty and spicy ingredients. 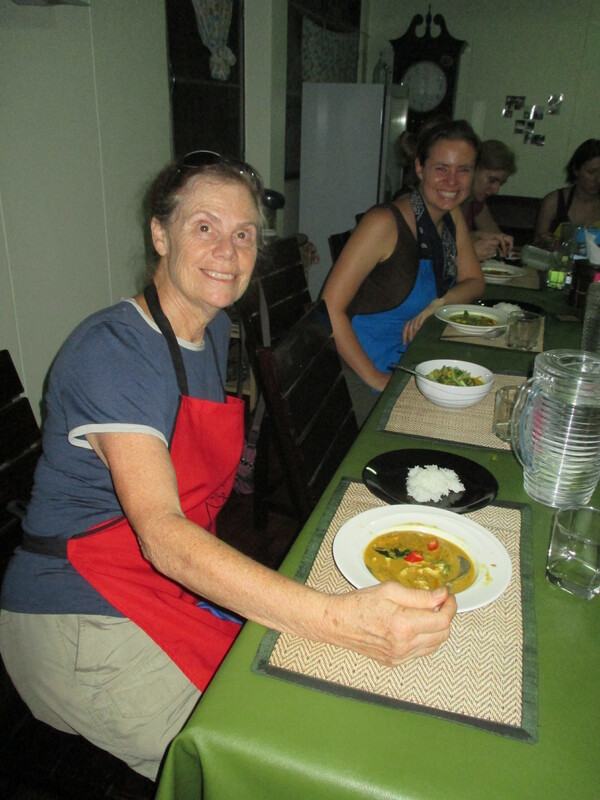 Della made Green Curry paste, Eric made Khao Soi Curry Paste, and Peggy made Panang Curry Paste. After all the pounding and grinding to get the paste, we each made the corresponding curry. Eric’s was slightly different as his was more of a curry noodle soup (a Chiang Mai specialty) and his was quite a bit more complicated. He was also the only one in the class who chose this dish so had to do the grinding of the curry paste all on his own! He didn’t report being too sore though! We all learned how to make Mango Sticky Rice. Yum! We learned a lot about making sticky rice that we didn’t know: for example, it is steamed, not boiled! One of the best parts of the class was that we got to eat everything we cooked. It was all delicious and we were quite stuffed by the end! We can’t wait to get home and try out our new, mad Thai cooking skills. We are hoping that we are able to find all of the proper ingredients at home in Denver. We know we might be making quite a lot of trips to HMart in our future!